Fall is here. In case you didn't already know that...I mean, I've literally been in denial since Labor Day, but last week as the calendar glared the reality that Fall has indeed arrived, I have no choice but to accept this reality. I was out on a walk recently with my daughter noticing the slightly cooler temperatures and perhaps, maybe a leaf or two along the sidewalk, when my denial slowly began to crack. I don't hate Fall, but I do love Summer. I love the Sunny days and warmth - I love having need for the air conditioner to be on. I love beaches, wearing my cut-off shorts and tank tops and flip-flops, and never worrying weather I've worn enough layers on a certain day. That being said, I'm gaining a new appreciation for Fall - especially after last year's Fall firsts. 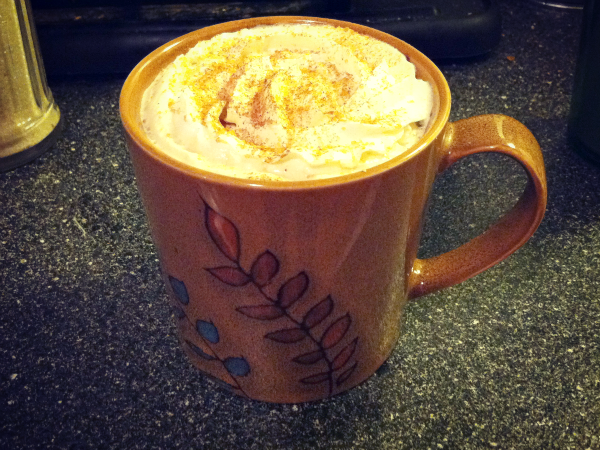 And, well, Starbuck's Salted Caramel Mochas have been helping with the transition too. 1. Apple Picking - We went for the first time last year and had a ton of fun. 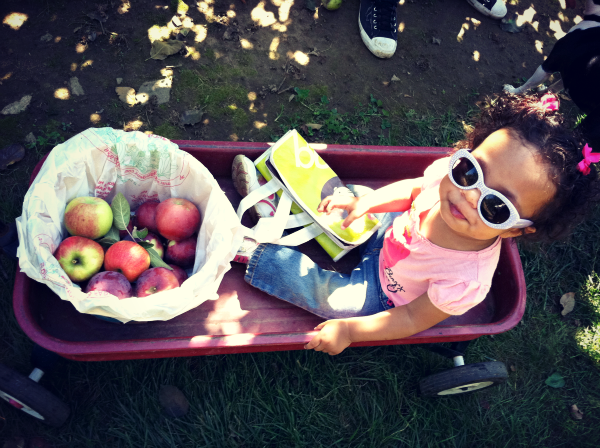 Zion loved riding around in the little Radio Flyer wagon they provided us with as we picked from many different varieties of apples to take home and enjoy. 2. Baking - A huge family tradition in the Fall and leading up to the holiday season is baking - everything from cookies, to candies and even cupcakes too. 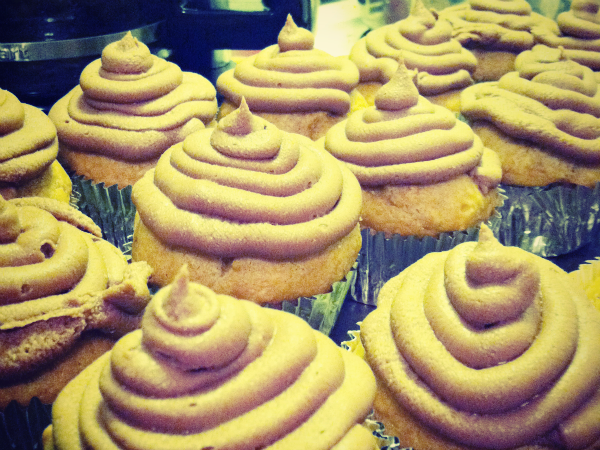 Pictured above - pumpkin cupcakes with nutella buttercream frosting! 3. Fall Decor - I love the warm colors of Fall, and this year I'm in looking forward to getting a little bit crafty and adding that warmth to our home. 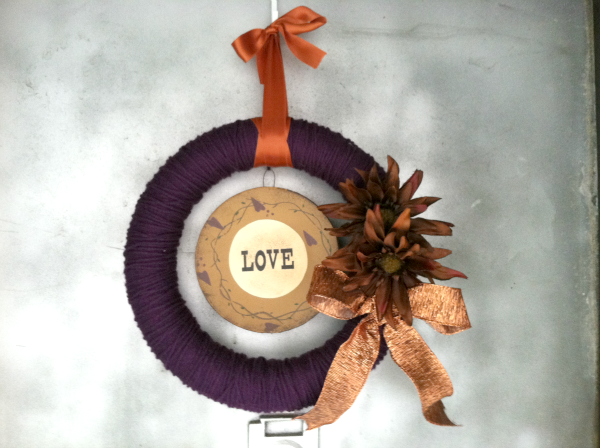 I loved making this royal purple and bronze wreath last year. 4. 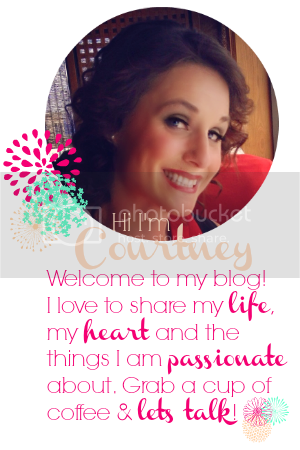 Did I mention I love coffee? I also love making fancy coffee drinks at home. Though I do enjoy coffee year round, I give myself special permission to indulge in fancy coffees (peanut butter chocolate mocha anyone) as we inch towards the holidays. 5. 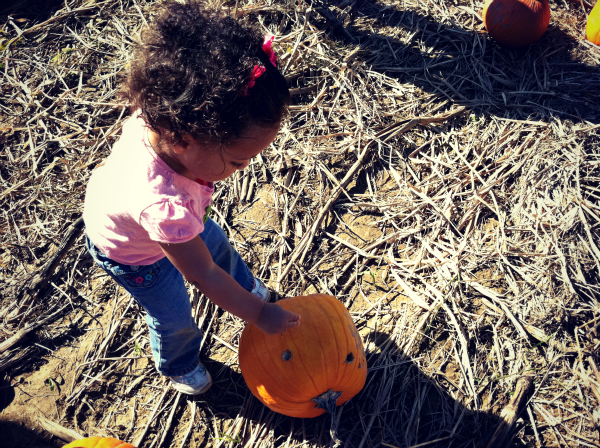 Pumpkin patch! I can't wait for Zion to pick out a pumpkin. We aren't big halloween people, but we still enjoy harvesting a pumpkin or two - and roasting the seeds! I'm loving the cooler weather, and the fact that now that it's cool we can have more blankets on the bed!